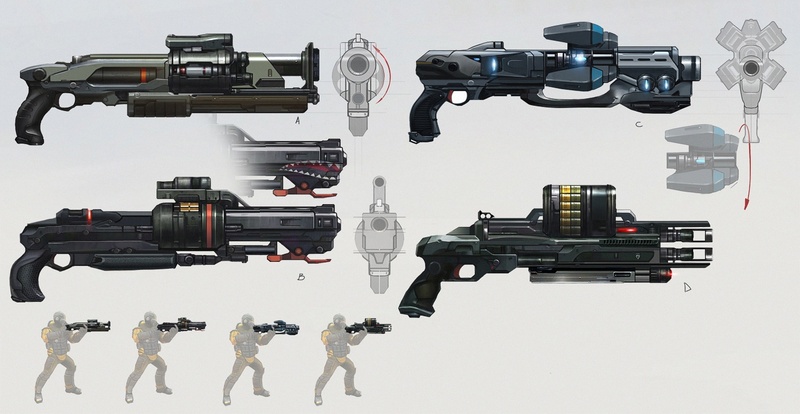 The Shotguns is one of Weapons type in the Evolution: Battle for Utopia game. Shotguns deliver a devastating attack at close range. As such they are very effective against enemies that do melee attacks. Their effectiveness is lessened when attacking from farther away. Long distance shots only deliver 30% of the their rated damage. – Regular Damage. Good for unarmored targets (100% damage), but totally useless for armored (0%). This type of damage is Most common among Shotguns (4 of 8). – Energy Damage. Good for unarmored targets (100% damage) and useful for armored (50%). This type of damage have two Shotguns – premium Megathrone and “ordinary” Dominion. Last and the best shotgun in the game at this moment. – Incendiary Damage. Excellent for unarmored targets (130% damage), but totally useless for armored (0%). This type of damage has only one Shotgun (Dragon). – Acid Damage. Good for unarmored targets (100% damage) and just brilliant for armored (130%). This type of damage has only one Shotgun (Acid). Was the best shotgun in the game until “Legacy of Dominion” update. All Shotguns (except Dominion) can be found only in the secondary story-line locations. Unlike Pistols, all Shotguns have the same reload slider: , same rate of fire and reload time (except Puma Shotgun). Shotguns are the only weapons having an available Grenade Launcher add-on. What about at half distance, and closer distance before melee distance ? How much damage does shotguns deal at those distances? I’m guessing it’s around 50% at close distance, and finally 100% at point-blank distance. against armored enemies, I think Acid is still the best shotgun.